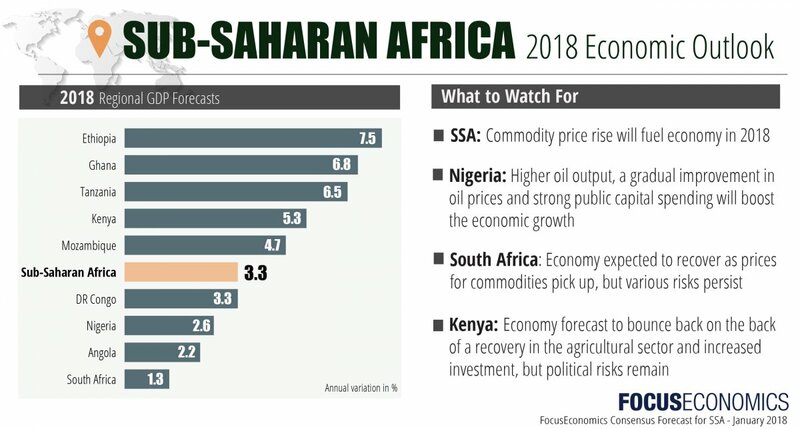 Growth in the Sub-Saharan Africa (SSA) economy was steady in the third quarter and the region remains firmly entrenched on a path to recovery after a sharp slowdown in 2016. Preliminary data revealed that regional GDP expanded 2.6% annually in Q3, matching Q2’s result. The third-quarter reading marks the second strongest growth rate in nearly two years as the SSA economy benefits from commodities prices firming up and stronger global growth. Looking at the third-quarter growth figure in detail, South Africa’s economy lost momentum. Weak confidence, high unemployment and a sharp drop in exports held back growth. The country’s recovery has been rocky due to political uncertainties and underwhelming structural reforms. While progress has been made, stronger policy action is needed to address labor market rigidities and inefficient state-owned enterprises. In contrast, Nigeria’s economy gained steam, growing at the fastest pace since Q3 2015 on the back of higher oil prices and production. Meanwhile, growth in Mozambique was steady at Q2’s pace. GDP data is still outstanding for the remainder of the region’s economies. The region’s political scene has remained tumultuous in recent weeks. After two divisive votes, Uhuru Kenyatta was finally sworn in for a second term as president of Kenya on 28 November, although the political situation remains tense. Concerns over the country’s institutions and the legitimacy of the election persist, and these issues are likely to continue weighing on confidence going forward. Meanwhile, a leadership crisis is brewing in Uganda, as President Yoweri Museveni seeks to abolish age limits for presidents—some analysts see this as an attempt to run for a sixth term. The move has sparked outrage and could lead to social unrest if the measure is enacted. In South Africa, the governing African National Congress (ANC) will elect a new leader at the 16- 20 December conference. The race between candidates is tight, and the new leader could influence policy in the coming year and be the next leader of the country if the ANC holds on to power in the 2019 vote. Higher commodity prices, lower inflation and improved access to international financial markets should lead the recovery to pick up steam next year, following a projected 2.4% expansion in 2017. The Consensus Forecast for the region’s economy was left unchanged this month, and GDP is seen growing 3.3% in 2018. However, numerous risks surround the outlook, including upcoming elections, rising public debt and exchange rate distortions in many economies. In 2019, GDP is projected to expand 3.6%. This month’s unchanged 2018 growth forecast for the region was driven by stable prospects for 9 of the region’s 13 economies. Meanwhile, projections were upgraded for the DRC, Ethiopia and Ghana. Ghana’s economy is seen benefiting from healthy global demand next year, while higher commodities prices should boost the DRC’s outlook. Angola was the only economy to see its 2018 GDP projection cut as exchange rate imbalances and low reserves create economic distortions. Ethiopia is projected to be the region’s top performer next year, growing 7.5%. On the other hand, growth in the region’s heavyweights is expected to be lackluster. South Africa is projected to expand 1.3%, followed by Angola with 2.2% growth and Nigeria with a 2.6% expansion. The recovery gained momentum in the third quarter, after the economy grew for the first time in over a year in the second quarter. Activity was spurred by a stronger energy sector thanks to higher oil prices and a return to normal production levels following the completion of maintenance work earlier in the year. Outside of the oil sector, however, the economy performed poorly. Stubbornly high inflation eroded households’ purchasing power and services activity plunged. Available data for the fourth quarter suggests that the economic recovery remains largely on track: The PMI signaled healthy growth in November. On a troubling note, the Petroleum and Natural Gas Senior Staff Association of Nigeria—a major oil union—is threatening to launch a nationwide strike on 18 December over a labor dispute, a move that could dent allimportant oil output. Nigeria’s energy production has been volatile in recent years, plagued by militant attacks, industrial action and poor infrastructure. Higher oil output, a gradual improvement in oil prices and strong public capital spending is seen boosting growth next year. For the economy to really take off, however, several structural issues need to be addressed by authorities. These include exchange rate distortions, inadequate infrastructure and a weak business climate. FocusEconomics panelists see the economy growing 2.6%, unchanged from last month’s forecast. In 2019, GDP is seen expanding 2.9%. The highly anticipated National Congress of the ANC, where a successor to President Jacob Zuma as party leader will be chosen, will be held on 16–20 December. The close race between Nkosazana Dlamini-Zuma, who is endorsed by President Zuma, and Deputy President Cyril Ramaphosa will have a significant impact on the country’s economic prospects in the upcoming years. If Zuma’s choice is elected, it could mark the consolidation of his patronage network, which would not bode well for tackling deepseated economic problems such as elevated youth unemployment and the loss of competitiveness in key sectors due to red tape and cumbersome laws that deter investment. Although solid growth was recorded in Q3, showing that the economy is gaining traction after exiting a technical recession in Q2, it has done little to placate growing concerns over the economy’s underlying health. On 24 November, S&P Global Ratings downgraded South Africa’s credit rating over concerns of the health of public finances and reform outlook, while Moody’s placed its credit rating on review for a downgrade. Fitch Ratings will decide after the ANC Conference. The economy is expected to recover as prices for commodities pick up. Economic growth will remain constrained, however, as abysmal business confidence, political uncertainty and high unemployment weigh on fixed investment and private consumption. FocusEconomics panelists expect the economy to grow 1.3% in 2018, which is unchanged from last month’s forecast, and 1.7% in 2019. President João Lourenço unexpectedly fired Isabel dos Santos, the former president’s daughter, from her position as head of the state-owned oil enterprise, Sonangol, on 14 November. The decision was part of an administrative reshuffling underway since Lourenço took office in September and was interpreted as an attempt to dismantle the dos Santos family’s extensive patronage network. While it remains to be seen if the high-profile dismissal is an attempt by the president to overhaul Sonangol, it is a bold political decision that reflects how the new president is forging his own political path. The latest domestic developments have increased the prospects that a currency devaluation is looming, which would help eliminate market distortions and rekindle private sector growth, despite also causing economic pain. A devaluation of the kwanza, fiscal consolidation and economic diversification measures were included in newly elaborated government plans to jumpstart growth. In its most recent staff visit in November, the IMF discussed these measures with the government. The economy is set to grow moderately on the back of higher oil prices but the existence of structural imbalances in the economy and prospects of reform implementation could dent growth. FocusEconomics panelists expect GDP to expand 2.2% in 2018, which is down 0.3 percentage points from last month’s forecast. For 2019, growth is expected to reach 2.7%. Uhuru Kenyatta was sworn in as the President of Kenya for a second term on 28 November, following the Supreme Court’s decision to uphold his victory in the 26 October election re-run. The country’s tumultuous election saga dragged on, however, as factions within the opposition rejected Kenyatta’s presidency and scattered protests persisted. Months of heightened uncertainty, stemming from the prolonged election period marred by a botched election and sporadic bouts of violence, severely dented economic activity, which was already beset by a devastating drought. While the economic picture is set to remain austere, November’s PMI reading provided a glimmer of hope when it jumped from October’s record low. Nevertheless, the PMI remained in contractionary territory, where it has been since May. A sharp drop in private sector credit growth, following the introduction of the government’s interest rate cap on commercial bank lending rates in September 2016, is another major impediment to reviving growth. While the government has announced it plans to scrap the policy, the timing is still uncertain. The economy is expected to bounce back next year on the back of a recovery in the agricultural sector and increased investment. Lingering political tensions and the government’s interest rate cap policy pose significant downside risks, however. FocusEconomics panelists forecast GDP growth of 5.3% in 2018, which is unchanged from last month’s forecast, and project it increasing to 5.8% in 2019. Preliminary data revealed that price pressures continued to moderate in November, with regional inflation falling to the lowest level since July 2016. Inflation decreased from October’s 12.7% to 12.4% in November. Downward price pressures were seen in most of the economies for which data is available. Notably, inflation fell to an over four-year low in Kenya thanks to a slower rise in food prices. However, price pressures remain stubbornly high in Angola and Nigeria. Central banks across the region made different policy decisions in recent weeks. While faltering price pressures allowed the Bank of Ghana to cut its monetary policy rate at its November meeting, persistently high inflation drove the National Bank of Angola to hike the main interest rate on 30 November. Policymakers in both Nigeria and South Africa held rates unchanged in November. Inflation is expected to trend lower in the coming quarters and the Consensus Forecast is for inflation to average 10.3% in 2018, below the 13.3% projected for this year. The 2018 regional forecast was increased by 0.2 percentage points this month, largely due to a notable upgrade to Angola’s projection amid rampant inflation in the economy. In 2019, our panel expects regional inflation to average 8.6%.